Did you love the Rob Prior and Tech N9ne art collabs? Don’t miss your chance to meet both artists in St. Louis during Wizard World! 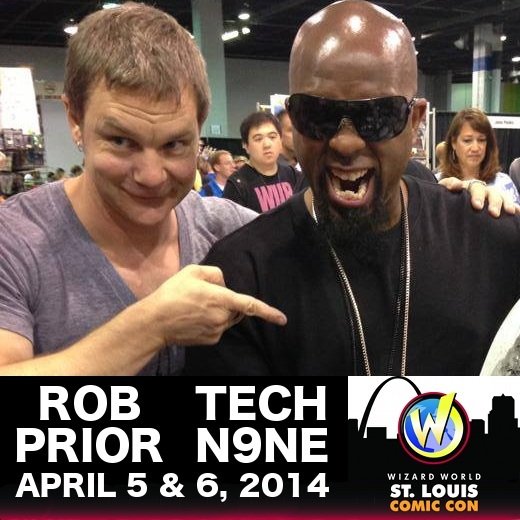 Tech N9ne and Rob Prior will be appearing at the famed comic con in St. Louis, which goes down at America’s Center from April 4-6. On the Saturday and Sunday of that weekend (April 5 and 6), the two will have their own booth where you can get your stuff signed and take pictures with the insanely creative pair. Like all Wizard Worlds, this event will be a star studded occasion that you don’t want to miss. Other guests that will appear at the St. Louis Wizard World include Adam West (the original Batman), Eliza Dushku (Buffy The Vampire Slayer), William Shatner (any explanation needed? ), Bruce Cambpell, Run (from Run DMC) and many more. – Have you been to a Wizard World Comic Con? What did you think?